Cheer us on and watch us compete at the St. Louis Champs! Keep tabs on our score throughout the day on our TBA page! AMES, IA– Story County 4-H Team Neutrino competed at the North Star FIRST (For Inspiration and Recognition of Science and Technology) Robotics Competition in Minneapolis, Minnesota on April 5-8, 2017. 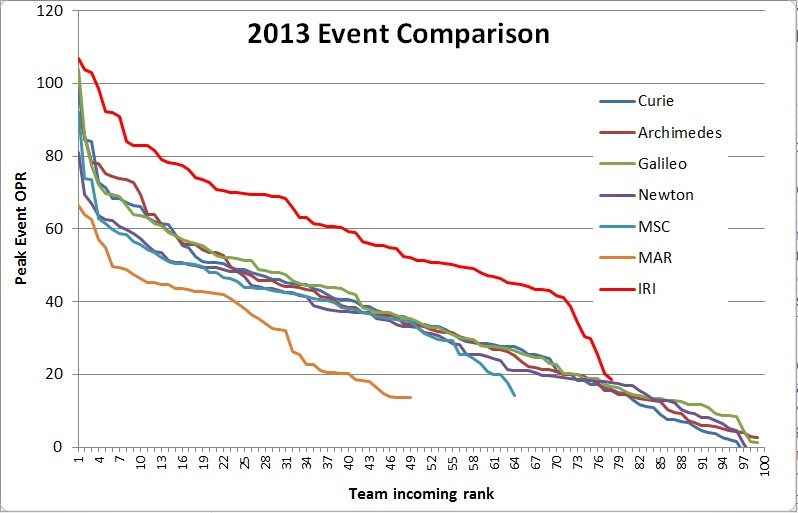 After 80 qualification matches, the team was ranked second, and finished in elimination matches as semifinalists. Team Neutrino then won the most prestigious award in FIRST, the Chairman’s Award, which honors the team that best represents a model for other teams to emulate and best embodies the purpose and goals of FIRST. The team submitted an essay and executive summary, and gave a presentation to the judges about how the team has influenced its members and their communities. Last year, Team Neutrino put in 2,600 volunteer hours, reached out to 140,000 individuals, and attended 29 outreach events. These included the Mini Maker Faire, Girls in Science Festival, Science Nights, and the Iowa State Fair. In addition to outreach, Team Neutrino values mentoring other FIRST teams and has started a total of 27 teams, and mentored 40. 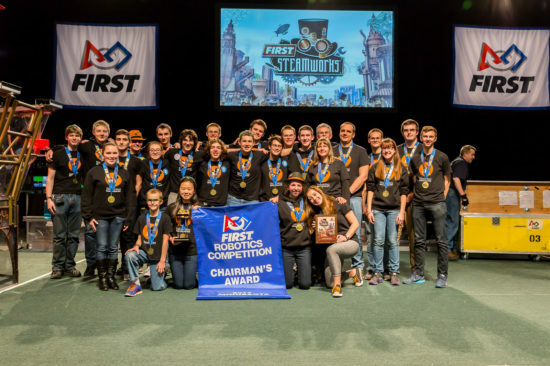 Winning the Chairman’s Award qualified them for the World Championships in St. Louis on April 26 – April 29, 2017 where they will compete with more than 400 other teams from 5 different countries, including 6 other Iowa teams. 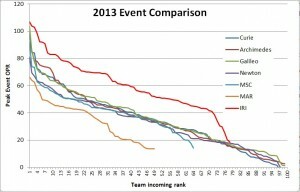 This year is Team Neutrino’s sixth season, and work began in January, with team members working up to twenty-six hours a week outside of school hours. The team meets on Iowa State campus through their partnership with the university. Members of the team come from Ballard, Nevada, and Ames High School. Team mentors include John Deere employees, Interstate Battery employees, Iowa State University students, team alumni and parents of team members. Team Neutrino requires abundant resources to create a functional robot and meet their annual team expenses. Support for the team comes from grants, in-kind donations and the support of many sponsors and partners: John Deere, Danfoss, Monsanto Fund, CIT Signature Transportation, Quality Manufacturing, Interstate Batteries, Ames Electric Services, Iowa 4-H Foundation, Emerson, Jimmy John’s, Meier Bernstein Arts in STEM Project, Thrivent Financial, Accurate Perforating Company, Story County 4-H, Boyd Lab, and the Iowa State College of Engineering. The team especially appreciates John Deere who provides them with not only registration fees and mentors, but a total of $13,000 for the season. For more information about Team Neutrino, or to watch the live webcast, visit their website at www.teamneutrino.org. 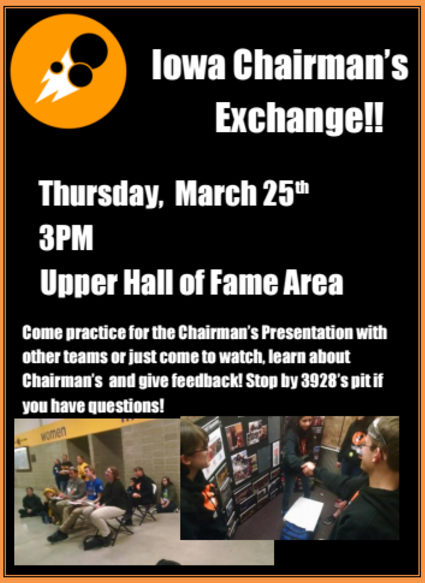 Don’t forget about our opportunity on Thursday to practice your chairman’s presentation and get feedback!